New-age carrier Vietjet officially launched a new service connecting Phu Quoc Island and the South Korean capital of Seoul on 22 December 2018, contributing to the promotion of tourism, trade and integration between Vietnam and South Korea and across the region. 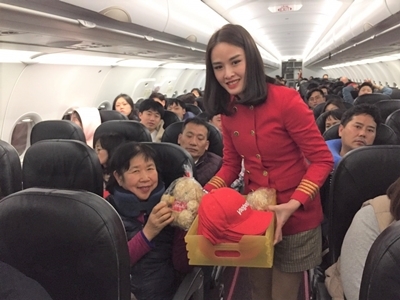 Passengers on board the maiden flight from Phu Quoc to Seoul as well as on the return flight enjoyed a fun, festive atmosphere, receiving flowers and charming souvenirs from Vietjet’s stewards. The Phu Quoc – Seoul route will operate daily return flights with a flight time of approximately 5.5 hours per leg. The flight departs from Phu Quoc each day at 3.40pm and arrives in Seoul at 10.55pm. The return flight takes off from Seoul at 1.45am and lands in Phu Quoc at 5.35am (all local time). Tickets for the new route are available for booking via all sales channels with a special promotion running between 1.00pm to 3.00pm everyday on www.vietjetair.com (also compatible with smartphones at www.m.vietjetair.com) or https://www.facebook.com/VietjetMalaysia (just click the “Booking” tab). In celebration and welcome of the airline’s new route, Vinpearl Discovery Phu Quoc is offering travellers a number of attractive promotions when they show their Vietjet boarding pass for all flights between Phu Quoc and Seoul. These include free green fees for one round of golf with one booked room, and a 50% discount on the listed price for entrance tickets to the VinPearl Land amusement park and VinPearl Safari park. The promotion runs from March 25, 2019 to November 30, 2019. Dubbed “the Pearl Island”, Phu Quoc is located in the southern province of Kien Giang and covers an area of about 570 square kilometres, making it the largest island in Vietnam. As one of the most talked-about tourism destinations in Asia, Phu Quoc has attracted strong levels of investment in hotels and resorts in recent years. With this new service linking Phu Quoc and Seoul, Vietjet aims to not only create more convenient travelling opportunities for locals and tourists in both countries but also further fly the flag for this stunning island and contribute to the growth of tourism and trade on this amazing destination. Apart from the new Phu Quoc – Seoul route, Vietjet currently operates seven other routes between South Korea and Vietnam, including Seoul – Hanoi/ Ho Chi Minh City/ Hai Phong/ Da Nang/ Nha Trang, Hanoi – Busan, and Da Nang – Daegu.